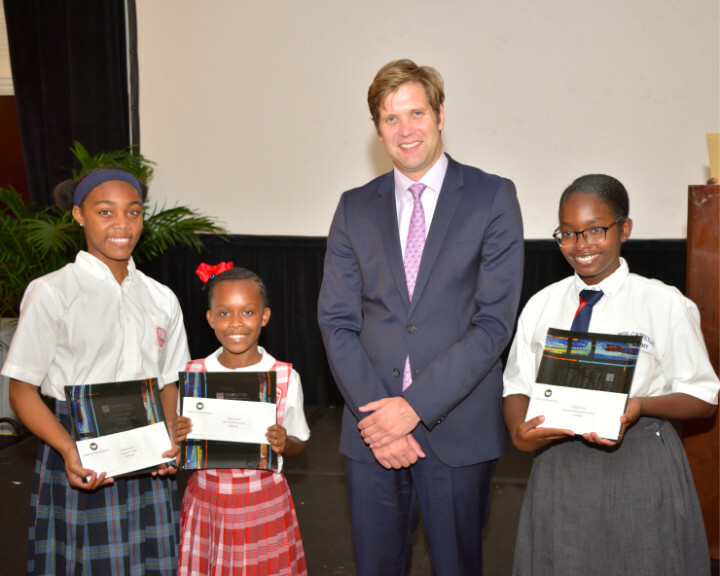 K’Shura Hanna (pictured on far right) a tenth grade student of Mary Star of The Sea Catholic Academy in Grand Bahama became the first student to win both the Senior Division and be named overall winner of the Templeton Laws of Life Essay Competition. The winner or the Junior Division was Danielle Saunders from St. Augustines College (Far Left) . R’Yanna Wilson (second from left) of Sadie Curtis Primary School won the Primary Division. Pictured in the middle is Dr. Andrew Serazin, President of the Templeton World Charity Foundation who presented the awards. K’Shura Hanna made history when she became the first tenth grader and first student from Grand Bahama to capture both the Senior Division Award and the Sir John Templeton Memorial Floating Trophy as Overall Winner in the 2018 Templeton World Charity Foundation/Ministry of Education Laws of Life Essay Competition. The tenth grader said she was humbled, thanking God, her family and teachers for pushing her to victory. Hanna’s winning essay dominated 2000 submissions at the Annual Laws of Life Essay Competition. Categorized into Primary, Junior and Senior Divisions, the competition celebrated 10 years since it was reintroduced into Bahamian schools. To commemorate the milestone, a video competition was added to the lineup. Danielle Saunders, of St. Augustine’s College, won the Junior Division and R’Yanna Wilson, a 5th grader from Sadie Curtis Primary School won the Primary Division. Capturing the Minister’s Cup as winners of the first annual video contest was a group of students comprised of Aneka and Charisma Minnis of Queen’s College and Jurusha Munroe of St. Anne’s High School. Nearly 80 finalists, along with supporters, filled the ballroom at the British Colonial Hilton on Thursday, May 31, 2018. There were a number of special guests in the crowd who gave inspirational remarks. They included: Heather Templeton Dill, granddaughter of the late Sir John Templeton and President of the John Templeton Foundation, Dr. Andrew Serazin, President of the Templeton World Charity Foundation (TWCF) and Education Minister, Hon. Jeffrey Lloyd. Templeton-Dill described the event as a joy and explained the rationale behind the essay competition. The TWCF President spoke to the true meaning of the 10 year milestone. Minister Lloyd left the students with three proverbs: “Be Humble”, “Be Grateful” and “Always Do Your Best”. He also gave words of encouragement to parents. Organizers say in the years to come, the primary goal of the competition will remain the same - instilling the importance of meaning, purpose and truth to the laws of everyday life. For more information on the competition, visit Laws of Life Essay Competition Bahamas on Facebook.